"Transnational cooperation in Central Europe"
On the 23 rd. of May 2013 in Szczecin in the Council of Zachodniopomorskie District in Mickiewicza 41 Street an informational seminar called "Transnational cooperation in Central Europe", took place. 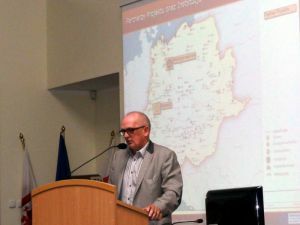 The Mayor of Kostrzyn nad Odrą, Mr dr Andrzej Kunt, took active part in the seminar and presented its audience with a speech on the project "Forte Cultura". While holding the presentation the mayor introduced all advantages and possible profits resulting from transnational enterprise. The regional seminar on Central Europe's future 2014-2020 was initiated by National Contact Point of the Central Europe Programme together with Marshal Office of Zachodniopomorskie district. Its aim was to show achievements of transnational cooperation in this region through numerous presentations on the projects accomplished with the help of institutions deriving from three polish districts: zachodniopomorskie, lubuskie and łódzkie.